February brings us to discoveries of several new webcomics across various platforms. Some of these webcomics have been going for a while. Some of them are ones we’ve just discovered. Now you can discover them too! The Immonen’s newest project is a sprawling space comic all drawn in square panels, each perfect for an Instagram post. It starts off a little choppy—you have to swipe through a collection of single panels without the context of a full page. As more characters are introduced the scope becomes more tangible, and the world becomes a little more fleshed out. The art is lush and bright, with beautiful oranges and greens, and while we’re just getting to know the characters and the world, I already know I’ll love it. A tall fashion woman and her lover, a small, angry space tech? That’s all I need to keep reading. 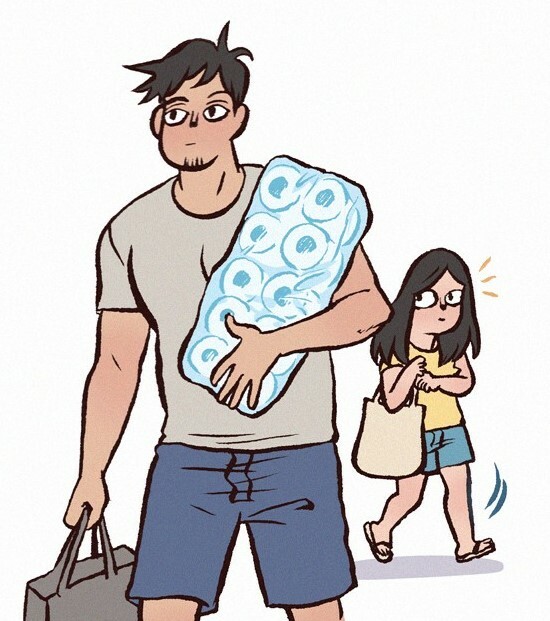 Webtoons is quickly becoming one of my favorite apps, and I’m prone to opening random webcomics on it and just binge-reading everything that’s been put out for them so far in one big swoop. LUMINE is my most recent of these, a cute story about friendship, werewolves, and magic. It follows the titular werewolf Lumine as he tries to find his place in the world, having been separated from his family and forced to live on the run in a world that values werewolves as something to be slaughtered and sold on the black market. The primary plot is centered around his blossoming friendship with the withdrawn and lonely Kody, a young son of a witch who Lumine is hired to protect. There’s a lot of goofy moments between the two, with Lumine trying to earn Kody’s friendship and often stumbling around in the process. The art is clean and easy to follow, with small panels on a white background, presented one at a time and with simple lettering beside it in the white space. It works exceptionally well on a mobile device, which is how I’ve been reading all these Webtoons comics—it’s really well suited to the format, I think! 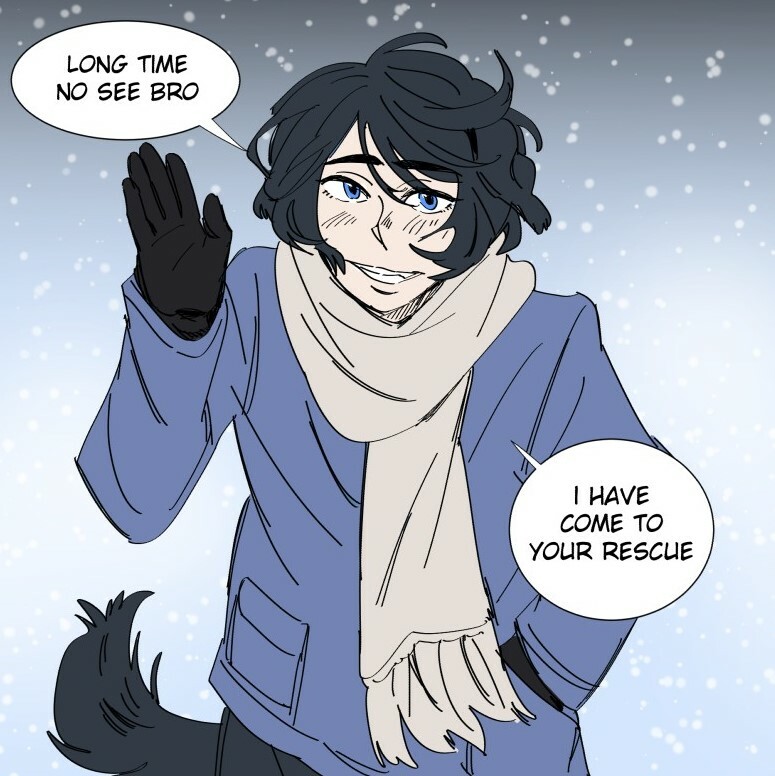 It’s also adorable, full of cute puppy dog eyes from Lumine and the charming clumsiness of Kody’s family of bodyguards. Things take a bit of a darker turn in the more recent chapters, and I’m pretty well invested in the story and characters now, so I’m looking forward to the next update. 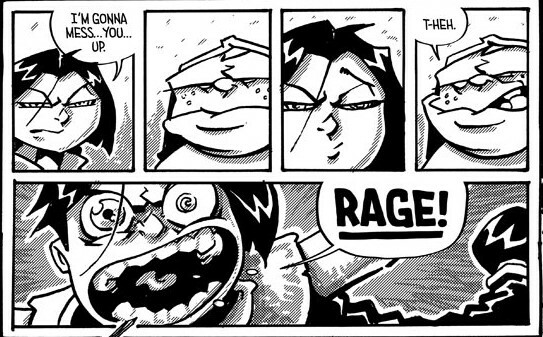 Hunting around the internet, researching Nate Piekos for my recent interview, I discovered that he wrote and drew webcomics. He is the creator of Atland and The Berserker’s Daughter, and, as the mastermind behind Blambot, you know that these webcomics are going to show off his skills as a letterer. Playing with fantasy and Dungeons & Dragons RPG tropes, The Berserker’s Daughter is an adorable, fun, all-ages comic starring Ruby, the daughter of a berserker, and the young troll, named Troll, she meets on a bridge. They become fast friends and wander around seeking awesome adventures across 22 episodes that are also collected in book format. Their adventures evoke fond memories of my own imaginary adventures of yore, where dragons and spooky caves offered hours of entertainment. This is the kind of sweet, wholesome entertainment that everyone needs in their lives from time to time. This comic strip is exactly what it sounds like: a fluffy slice-of-life about Fishball’s giant nerd boyfriend. It’s honestly one of my favorite current diary comics, funny and charming. Its format is simple—usually single panels with white backgrounds, arranged vertically—and Fishball really uses that simplicity to her advantage, often building up to a single hilarious punchline. Her art is lively and expressive, and her humor is a great blend of slapstick, absurdity, and silliness, and the joke never feels like it’s gone too far. As with many slice-of-life comics, there isn’t really a plot. Most strips are self-contained stories—which makes it easy to stop reading for a while then pick up after long stretches of time—and depict funny, absurd moments in this couple’s shared life. Fishball and her boyfriend are That Couple who tease each other mercilessly because they love each other so much, the ones who bicker cheerfully like that stereotype of an old married couple. It’s primarily told from Fishball’s perspective, but occasionally, the comic will turn into “My Tiny Weird Girlfriend,” told from her boyfriend’s POV. This comic is so fun that when I first discovered it, I binged the entire 200+ archive in one sitting. The best part: My Giant Nerd Boyfriend updates regularly and frequently, so you never have to wait long.